"These are the saddest of possible words—Tinker to Evers to Chance"
Shortstop Joe Tinker was part of the legendary double-play trio of Tinker, second baseman John Evers, and first baseman Frank Chance. This Baseball Hall of Famer was also an Oak Park resident from 1908 to 1914. Joe Tinker was born in 1880 in Muscotah, Kansas, and played professional baseball for 15 seasons from 1902 to 1916—most of them with the Chicago Cubs. Known as a light hitter, but an outstanding defensive player, Tinker led the National League in fielding among shortstops five times. During his years with the Cubs from 1902 to 1912, he helped the club win four National League pennants—in 1906, 1907, 1908, and 1910—and two World Series Championships in 1907 and 1908. 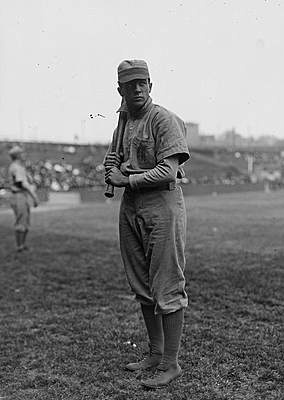 Following the 1912 season, Tinker was traded to the Cincinnati Reds, where he was player-manager. He stayed only one season and returned to Chicago as player-manager of the Chicago Federals and the Chicago Whales of the Federal League. He returned to the Cubs for a final season in 1916 as player-manager. Tinker was elected to the Baseball Hall of Fame, along with John Evers and Frank Chance in 1946; he died in Orlando, Florida in 1948. Franklin P. Adams immortalized the trio in his 1910 poem, "Baseball’s Sad Lexicon," with the phrase: "These are the saddest of possible words—Tinker to Evers to Chance." Some baseball historians believe the poem may have unwittingly aided the election of the three to the Hall of Fame. Joe, his wife Ruby, and sons Joe Jr. and Roland lived on Gunderson Avenue in Oak Park. Tinker appears to have been a popular figure around town, and April 23, 1914, was proclaimed "Joe Tinker Day" in Oak Park to honor his return as player-manager of the Chicago Federals. Local businessmen purchased a block of tickets and organized an automobile caravan to the ballpark for Opening Day. More than 20 automobiles, including Franklins, Overlands, Hudsons, Studebakers, Cadillacs, and Fords, were festooned with banners and pennants, and carried some 100 Oak Parkers to the first game ever played at Weeghman Park. Charlie Weeghman, owner of the Federals, called the ballpark "an edifice of beauty." Today we know it as Wrigley Field.